Be the first to share your favorite memory, photo or story of Valarie. This memorial page is dedicated for family, friends and future generations to celebrate the life of their loved one. 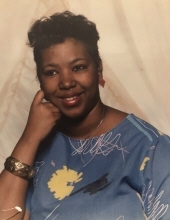 Valarie was affectionately loved and called “Val or Val Love” by many of her family and friends. She was born on April 25, 1965 to Lula Mae Love and the late Louie Love. She was the youngest of seven siblings. Her brother Darius Keaton preceded her in death. She departed from her earthly home to a home of eternal life on Sunday, July 8, 2018. Valarie leaves to cherish her life and loving memories her daughter: Shanterrica Love (Chris) of Quincy, Florida; sons: Dontavious Highman (Anna) of Tallahassee, Florida and Robert Kenon, Jr. of Orlando, Florida; mother: Lula Mae Love of Quincy, Florida; sisters: Lenora Ward (Charles) of Quincy, Florida and Nerissa Green (Jessie Jr.) of Midway, Florida; a very close and dear friend who was like a sister to her, Claudette James of Quincy, Florida; brothers: Ronald Dixon and Bernard Brown (Patricia) of Quincy, Florida and Keith Love of Tallahassee, Florida; grandchildren: Dontavious Butler, Ciriah Highman, Titus Highman and Malachi Jackson; godchildren: Shay Harris, Jarqueila Preston, Shaniqua Allen, Tisha Smith and Jarel Lanier; nieces: Tonecia Robinson, Jhalecia Gaines, Nyreesha Dixon and Patrice Brown; nephews: Christopher and Onterrio Ward, Christopher Brown, Dell Lewis, Sheldon Love and Omar Robinson; a host of great nieces, nephews, cousin and friends. Valarie was also preceded in death by her father, Louie Love. To plant a tree in memory of Valarie Denise Love, please visit our Tribute Store. "Email Address" would like to share the life celebration of Valarie Denise Love. Click on the "link" to go to share a favorite memory or leave a condolence message for the family.